Family — Happy Hearts Working, Inc. Living purposefully and serving joyfully. Learning lessons in patience, understanding, love, and acceptance. Marriage and raising children seemed “typical” and “normal” before having Jack and Nick, our twins and the fourth and fifth children in our family. When initially learning that I was going to have two baby boys, along with a three year old daughter, Jessie, seven year old son, Luke and nine year old daughter, Katie, I wanted to be certain that I could “be there” as a mom to each of our children. Wow, did I have a lot to learn about myself and how I view our world around us, when I gave birth to Jack and Nick, and learning of Jack’s medical diagnosis of Down Syndrome. I was anxious about being able to care for newborn twins, with added therapies and physician appointments to ensure Jack’s positive development. Along with their sisters and brother, Jack and Nick have taught our family how to live each day purposefully and joyfully! 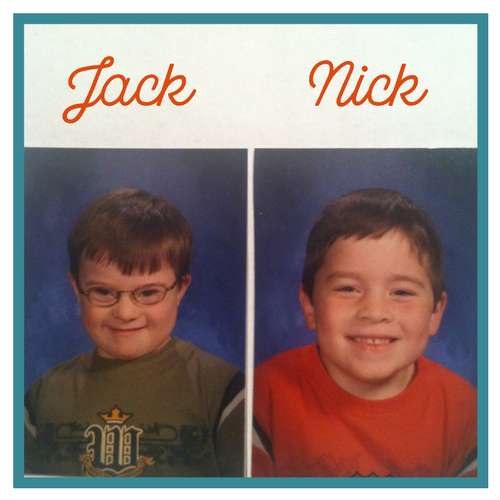 Jack and Nick have achieved developmental goals in such drastically different ways and at different times throughout their lives. Each member of our family has learned lessons in patience, understanding, love and acceptance. We have witnessed Jack struggle to perform everyday tasks and the frustrations he openly displays with his emotions. These challenges all fade with Jack’s pure joy in each of his successes as he matures. My husband, Steve and I understand the importance of maintaining the balance of mind, body and spirit among Jack and Nick, as well as their other siblings. Because of Jack having Down syndrome, so many blessings have been bestowed upon our family, re-energizing our faith and clarifying our perspective about what truly matters in life. By putting God first, all else falls into place. The ever-present support of our extended family, friends, school and faith community strengthens our family’s base for our daily journey through life! Do you want to get involved with Happy Hearts Working?